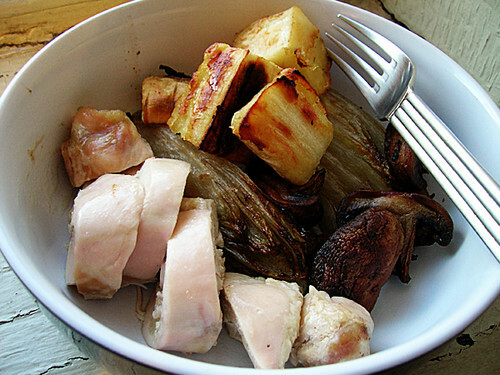 You know what's really good, roasted cabbage, but cabbages are too big. I was wishing out loud for a readily available tiny cabbage, and I think Lola said, "brussels sprouts" and I was like (:O and now also submit to you, belgian endive. This was the batch that I drowned in chicken fat, if these look a bit soggy. I think the concept is sound, still. Debone the chicken thighs using a very sharp, small knife. Sprinkle the cut side of the meat with a little salt and pepper. Arrange the pieces on the baking sheet, tucking the skin under the meat. Don't bother with aluminum foil. Also don't bother trimming the skin or if you do, scatter the extra pieces of skin on the baking sheet. Bake for 30 minutes, turning the sheet around halfway through if your oven is uneven. While the chicken is baking trim and halve the endives, scrub, trim, and cut the carrots into large pieces, and wipe, trim, and halve the mushrooms. Take the chicken pieces out of the pan and set them aside. If you did eight chicken thighs, drain some of the fat off and put the extra four chicken thighs away to eat with soup later in the week. Turn the oven up to 500 degrees. Arrange the vegetables on the baking sheet, carrots first, give them a 15 minute head start in the oven. Then add the endives and grapes and roast for another 15 minutes. Fill four jars with a sliced chicken thigh and a fourth of the roasted vegetables each, these you can just reheat in the microwave and eat. Or you know, eat whatever you want right away and put away whatever's left.